It’s been four months since Dr. Lammers joined us for an evening to talk about LOGOSYNTHESIS. Since then, I’ve had many interesting conversations trying to better understand the topic and how to convey its grace and eloquence to others. The more I learn, the more intrigued and fascinated I become. I want to share it with everyone but I have been struggling with trying to explain the details, trying to understand who is ready for it and worrying about what will happen if I do something wrong. I don’t want to promise something that can’t be delivered nor overstep boundaries. I have been using the process on these limiting beliefs. As my conversations unfold, I am appreciating a new perspective. 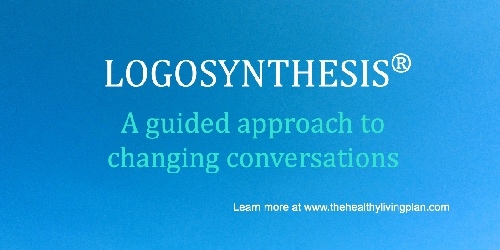 LOGOSYNTHESIS offers a unique, guided approach to changing my everyday conversations. I am noticing that rather than being absorbed in the details of what happened and offering my opinion on how to fix things, I am better equipped to listen and guide the dialogue. As I focus on what my friend or coworker is experiencing, I can facilitate their expression of what is bothering them and offer support through the use of the sentences. I appreciate that sometimes there is a little energy released to start to shift things. In some cases, there is a lot of energy released. I need to be sensitive and prepared. It is simple yet profound. For everyone who thinks that this is similar to other techniques, I encourage you not to ‘think again’ but to start working with it. We need guidance, training and practice to fully appreciate the work. There are professional resources available to help but I encourage you to start now! For more information, just ask!